See anything related to the sport Polo in an apparel setting and you know what designer comes to mind. 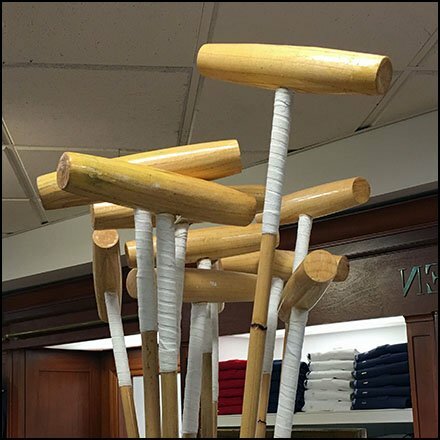 This Polo Mallet Branding at Polo Ralph Lauren in Macy’s triggers just that built-in response. Don’’t you wish you owned a brand with that kind of instant recognition, even though most of us have not seen Polo ever played. Compare and contrast to other occurrences seen, and note the differences in Mallet design. This implementation seen at The King of Prussia Mall, Philadelphia. “Polo Ralph Lauren Retail Fixtures Pinterest Board“ for a visual summary. “Polo Ralph Lauren Retail Fixtures Index Page” for all resources and links.